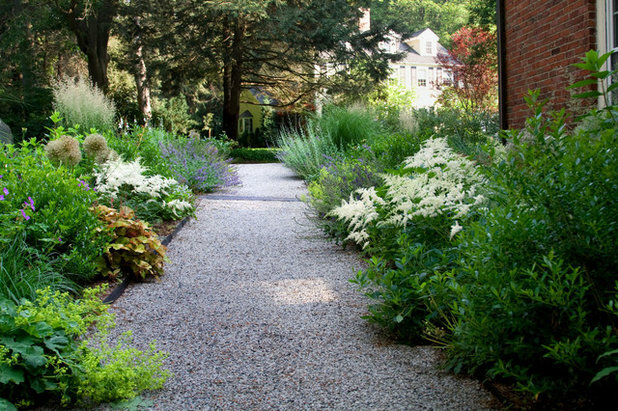 When people talk about the cottage garden style the picture that comes to mind is of an informal collection of flowers with a gravel path running down the middle. Traditionally gravel has been used for paths and driveways, but as you will discover there are far more ways that this versatile material can be of use in the garden. 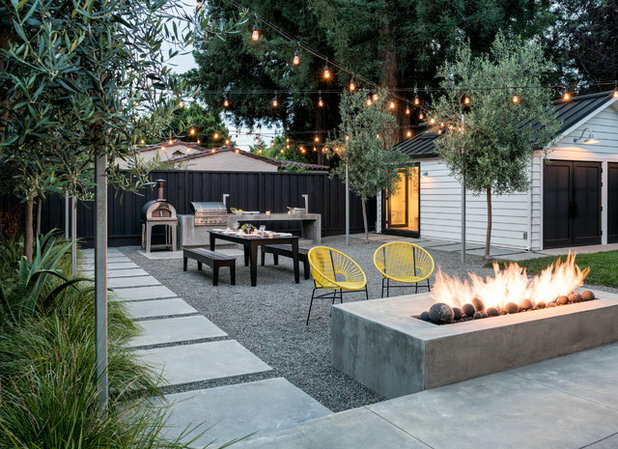 In her article which I found on the Houzz website Lauren Dunec Hoang suggests ten ideas for employing gravel in the landscape. Gravel is one of the most versatile landscape materials, as it can be used as anything from a pathway material to mulch. It’s an affordable hardscape material for outdoor seating areas, filler around flagstone pavers or a useful drainage tool. 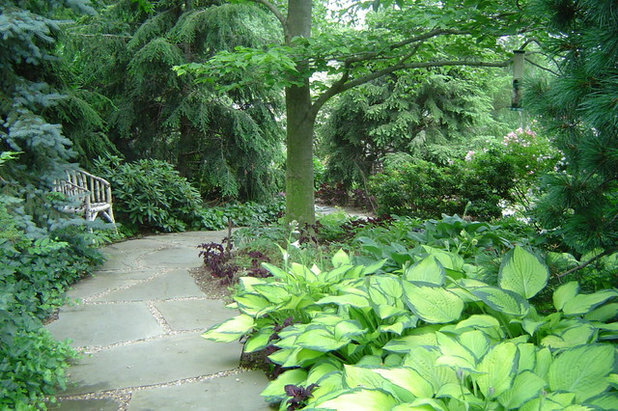 With many colors and sizes available, gravel works to enhance the look of many garden styles. Take a look at 10 ways to put gravel to work in your landscape. 1. Walkways. Gravel is a great walkway material, offering quick drainage and that pleasing crunch underfoot. Some gravels “roll” more than others. Proper installation as well as the type of gravel you select can make a big difference in how much the gravel rolls. To reduce rolling, choose either a fine gravel, like decomposed granite, or a larger crushed gravel that is heavier and locks itself in place better. To install a gravel walkway, first lay down a layer of base rock to act as a firm foundation for the walkway. After compacting the base rock, spread a layer of gravel 2 to 4 inches deep over the top, and compact again. Binding products are also available that can be washed over the top to hold gravel in place. 2. Mixed with flagstone. Gravel can fill the gaps between stone slabs on flagstone or paver pathways. It’s an attractive combination that’s easier to maintain than paver pathways that feature ground covers between stone slabs. Select a color of gravel that matches the flagstone or pavers. To prevent gravel traveling up onto the flagstones, start by installing a layer of compacted base rock, then lay the flagstones – setting them in the base rock so they’re slightly above what will be the gravel level – and spread gravel in the gaps. 3. Patios. In counties that regulate the amount of new impermeable hardscape added to a landscape, using gravel as a flooring material can expand your options for outdoor seating areas. Gravel acts as a permeable surface, since rainwater can drain through the stones. As a patio material, gravel makes a nice floor that adds texture but also visually reads as a unified surface.